You’ve finally decided on the water filter you want to install, now you’re faced with another decision – which kitchen tap to get? If you’re installing an under-sink water filter chances are you’ll need to replace your old kitchen tap, or at the very least, add a new tap to your kitchen sink. 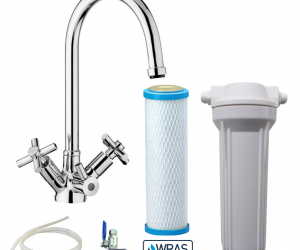 There are two situations when you don’t need to bother with a new tap – when installing a whole house water filter, or when installing an undersink filter in-line. In all other cases, you have two filter faucet options – a standard filter tap or a triflow tap (or 3-way tap). Let’s see which is which, and why you should choose one over the other. This kitchen faucet is a no thrills, no frills option: it has a single handle and a single outlet for filtered cold water. It’s also the more affordable choice of the two taps, and models start from as low as £20. They’re available in various designs from long-reach neck taps to stylish swan neck taps. 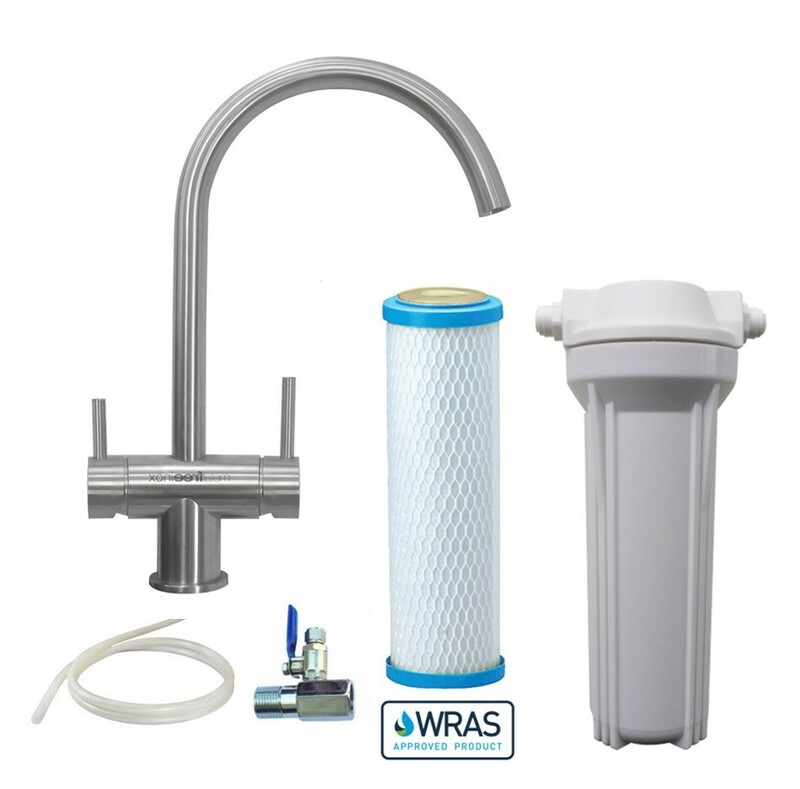 Some water filter brands include a standard filter tap with their filter kit, so you don’t even have to pay anything extra for a tap like this. – The Osmio Black Line EC-107 Non-Pumped 7-Stage Reverse Osmosis System, which is an affordably priced RO system with an up to 99% removal rate of hundreds of contaminants. All these filters and many more include a free filter tap, so you won’t have to pay extra for a second tap. The catch with these taps? Having to drill a hole in your kitchen sink to install the filter tap. This means that if you have a sink from an expensive material, drilling a hole can be risky. You might end up damaging your entire sink. Plus, an extra tap may look weird, especially on a smaller sink, although filter taps are somewhat smaller than regular taps. Other than this, there are no disadvantages to opting for a standard filter faucet. In fact, unlike 3-way taps, you don’t have to worry about brand compatibility issues. Plus, you get to keep your existing tap. If a standard filter tap doesn’t sound like a good match for you, perhaps a 3-way kitchen tap would be a better fit. These taps replace your existing kitchen tap and undertake its role of dispensing unfiltered hot and cold water and dispenses filtered cold water as well. You don’t need a new hole on your kitchen sink, and you can have a single tap taking care of all your water needs. They’re more expensive than regular filter taps and it’s rare that a brand will include them for free with their filter system. The good news is that these taps are worth every penny! A multitude of design and finish options to match your kitchen’s style. Some 3-way tap brands are known to have compatibility issues when it comes to undersink filters, which means that they’re only compatible with filters manufactured by the same brand. This problem may be fixed with the help of tap adapters, so ask your vendor if the tap you want is compatible with the filter you have, and whether they’re able to help you find a suitable adapter. 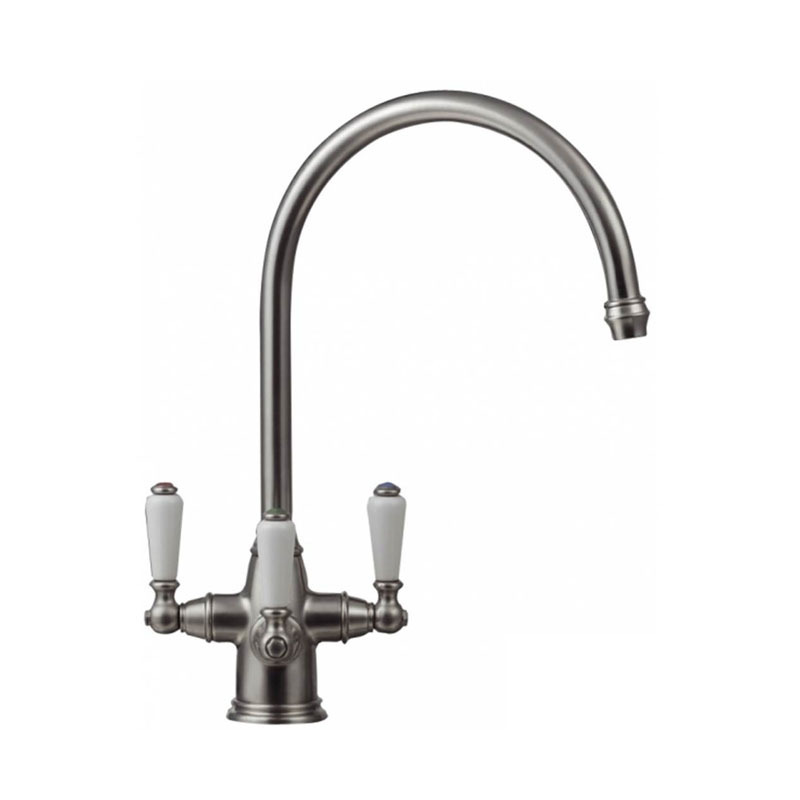 – The Franke Doric Chrome 3 Way Filterflow Tap, which features long-lasting and high quality components for an extended service life. All taps but the Brita (which comes with a Brita filter) are compatible with any filter kit of your choosing. Brita taps are designed to work only with Brita filters, but if you insist on combining a Brita tap with a filter of a different brand, we recommend asking your vendors about tap adapters that can help you overcome compatibility issues. 3-way taps are clearly the more advanced and feature rich option compared to standard filter faucets, but they might not necessarily be the best option for you. 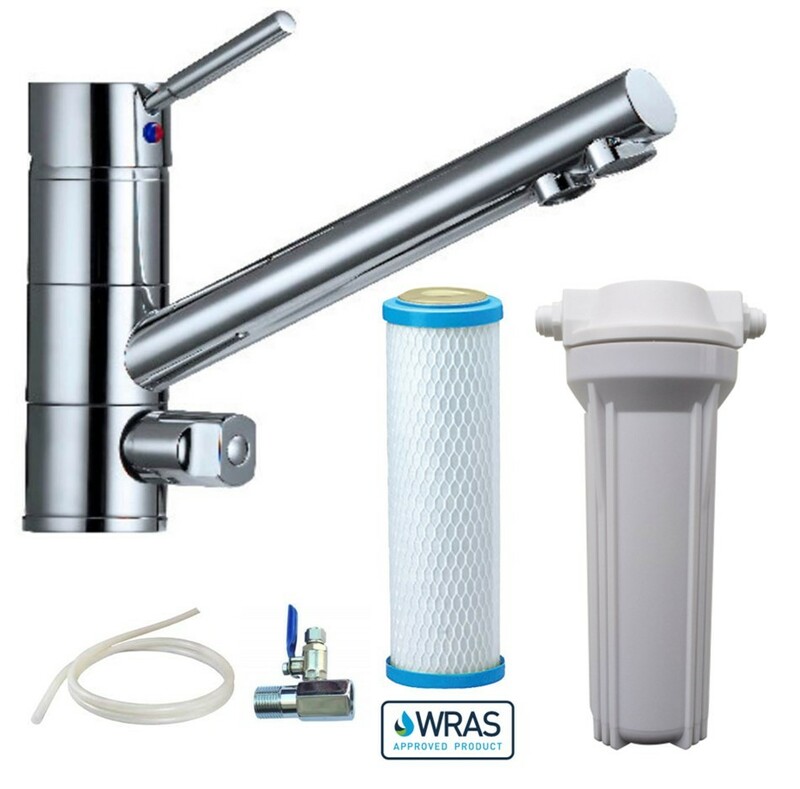 If you’re fond of your regular kitchen tap or just don’t want to spend the extra cash on a triflow tap, go with the tap that’s dispatched with your filter system. If you don’t care for your existing tap and you don’t want the hassle of installing an extra tap, upgrade to a triflow tap, which will conveniently replace your regular tap and make it easy for you to dispense portable and unfiltered water whenever you need it. 3-way taps are the convenient choice, but this convenience does come with a higher price tag. Standard filter taps are the cheaper option, but they come with the hassle of installation. At the end of the day, the filter tap that best meets your needs will be the better option for your regardless of the features of each individual tap. Whichever type of tap you need, we here at WaterFilterShop.co.uk have you covered!